was caused by rat infestations. also spread the poison to food consume by humans. chemical is used for blood thinning in heart attack and stroke treatment. Mice problem which are looking for food in the bushes, and tree trunks. Bushes at Orchard Road are filled with mice holes, the surrounding businesses often see a few mice in the Orchard Plaza area, and are forced to take some action. 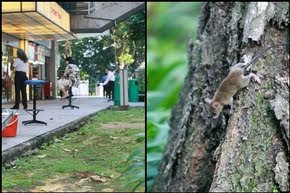 This is indeed shocking for so many rodents to be running around Orchard Road, Orchard Plaza is next to these bushes, and many businesses have pointed out that the problem of rat began to appear from the end of last year. Wong (48 years old, clothing store owner) said that, six months ago, he found the cookies placed in the store often bitten badly, but I do not know that was from the mouse. "Later, I sat in the afternoon enjoy the cool air outside the shop, only to find there are more than 10 rats, in the bushes in front of the shop drill holes there, people feel very sick about it." On one occasion, Mr Wong saw more than 30 mice, in the bushes channeling to go into shops, some even climbed up into ceiling. Many merchants said some regular customers know this have been going on in the River Valley Road area and avoided these areas, and change the building's entrance into the shops. Mr Wong said that the staff of several pest control companies have been spraying in the area last week, but the effect is not significant. "When it rains heavily the day before yesterday, a few rats even ran into my shop, frightened my 14-month-old baby. Rodent problem to continue to get dirty here, I am considering moving out here after the expiration of the lease. "